Replacing their rhythm section since 2008’s rather good The Thin Line Between has clearly not done these Montreal-based tech deathers any harm, as new album Asylon proves within seconds. As a band on their sixth full-length, Neuraxis have long since established their sound at the heavier end of countrymen Quo Vadis and Martyr’s more melodic form of tech-death, never losing a chance to pulverise the listener. I’m surprised that they’re treated as being on the melodic death spectrum at all, really, given the sheer brain-melting ferocity of certain moments here. Melody is present, but as a subliminal message inserted into the overriding brutal morass rather than something identifiable in its own right. This is definitely music for the sensory overload generation, pulsating lines of input ricocheting between your ears energetically, a cascading torrent of death metal. It’s clear that steps forward from The Thin Line Between have definitely been taken, although this is much less immediately enjoyable. The sort of songwriting on show here is the kind that takes multiple listens to fathom, as intense and inscrutable as that intriguing title. It’s certainly less melodic, there being none of the smooth likes of Wicked here or the experimental jazziness of Versus – instead, the band have pushed the heaviness to the max, toning it down for a couple of interlude atmospheric moments to give the listener a breather. This does make Asylon a bit of a struggle for the first few listens, as songs do little to differentiate themselves from each other, but persevere and sense does follow. Opener Reptile flows in softly with ambience, kicking into gear shortly after with technical Morbid Angel-esque slither, speeding up soon after and staying there as near-constant growls flow atop a mindmeltingly complex instrumental barrage. Follower Asylum continues in the same path, flowing briefly uphill into a sci-fi-esque repeated riff before collapsing back into heaviness – impressive stuff. Equally impressive is the tetchy, almost irritable riff upon riff of Saviour And Destroyer, hints of the melodic death base peeping out before being smothered by heaviness. By The Flesh enjoys changing speed on you, slowing down and speeding up at will, indulging in a nice bit of lead guitar, whilst Sinister’s Gojira-esque groove is a surprisingly catchy eye of the generally dense storm. You do have to concentrate to really appreciate the differences between tracks, as they do tend to melt into one long track –the gentle Resilience acts as an interlude with its gentle guitar and half-whispered vocals, but before you know it you’re back in the maelstrom again with Purity. Those new to the band should start with The Thin Line Between, an album I see that I scored rather low when I reviewed it in retrospect. 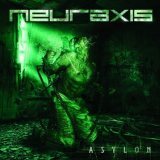 Although Asylon is not Neuraxis’ best work, it’s still more than worth a listen for fans of tech-death.